VIII, 190 p., 14,8 x 20,5 cm. This book contains new studies on the psychodynamics of those who are suicidal and the consequences of this for dealing with them in therapy. Empirical studies show the specific problems which potential suicides have with people in their environment. This applies in particular to their domestic partners, but similarly also to people who are trying to help them in therapy. Furthermore, the various psychotherapeutic model concepts of the origins of suicidal tendencies are described. The model derived from the psychoanalytic theory of narcissism is expanded, and more distinctions are made among the psychodynamics of the wound. Against this backdrop, the findings of the various studies are discussed. The result is an understanding of the relationship problems of the (potential) suicide which facilitates the contact with this person. This is illustrated using case studies of successful and unsuccessful crisis interventions and psychotherapeutic consultations. Walter A. Scobel: Suizid – Freiheit oder Krankheit? Christian Reimer / Heinz Henseler: Mißglückte Interventionen bei Suizidanten. 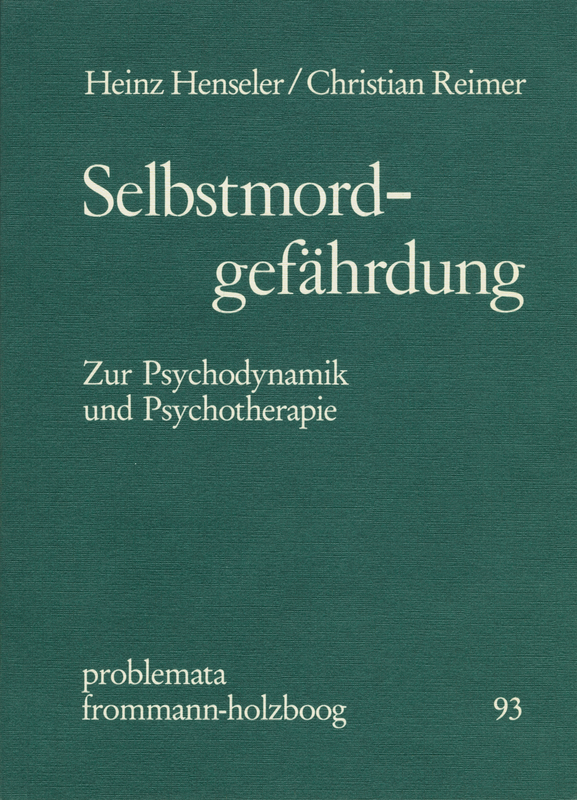 Dieses Buch verfolgt das erklärte Ziel, ein relativ einheitliches Konzept zum Phänomen der Suizidgefährdung vorzustellen und die sich daraus ergebenden Konsequenzen für die Therapie theoretisch und praktisch zu erläutern. Dieser Anspruch wird erfüllt [...] Das besondere Verdienst dieses Buches scheint mir zu sein, aufgezeigt zu haben, daß ein großer Teil der Suicidpatienten zu den narzißtischen Persönlichkeiten zu zählen ist, und daß diese mehr oder weniger, aber eben doch, durch Psychotherapie erreichbar sind. Also eine Ermutigung, sich als Psychotherapeut dieser Patientengruppe zu stellen.